Проведено аналіз хімічного складу червоного надгіганта PMMR23 у Малій Магеллановій Хмарі. Знайдено вміст 35 хімічних елементів, а для двох елементів (Tl та U) вказано верхню межу вмісту. Дефіцит відносного вмісту важких елементів в атмосфері PMMR23 на 0.6—1.0 dex менший за дефіцит елементів групи заліза. У спектрах червоних надгігантів Малої Магелланової Хмари PMMR27, PMMR48, PMMR102 та PMMR144, що належать до областей цієї галактики з відносно високими швидкостями руху зір і міжзоряного газу, знайдено емісійні компоненти в лінії водню Hα і показано відсутність такої емісії у спектрі PMMR23. Швидкості руху зір і міжзоряного газу в районі розташування PMMR23 відносно малі. Обговорюється вплив можливої акреції міжзоряного газу на атмосфери PMMR23 та інших надгігантів Магелланових Хмар. Були використані дані спектральних спостережень, отримані на 3.6-м телескопі Європейської Південної обсерваторії в Чилі з розділенням R = 30000. 1. S. M. Adams, C. S. Kochanek, J. R. Gerke, K. Z. Stanek, X. Dai, "The search for failed supernovae with the Large Binocular Telescope: confirmation of a disappearing star". arXiv:1609.01283. 2. P. C. Allende, D. L. Lambert, M. Asplund, "The forbidden abundance of Oxygen in the Sun". Astrophys. J. 556, L63—L66 (2001). 3. K. Bekki, "When was the Large Magellanic Cloud accreted on to the Galaxy?". Mon. Notic. Roy. Astron. Soc. 416 (3), 2359—2367 (2011). 5. E. Böhm-Vitense, "The puzzle of the metallic line stars". Publs Astron. Soc. Pacif. 118, 419—435 (2006). 6. A. Z. Bonanos, D. J. Lennon, F. Kohlinger, et al., "Spitzer SAGE-SMC infrared photometry of massive stars in the Small Magellanic Cloud". Astron. J. 140, 416—429 (2010). 7. A. Z. Bonanos, D. L. Massa, M. Sewilo, et al., "Spitzer SAGE infrared photometry of massive stars in the Large Magellanic Cloud". Astron. J. 138, 1003— 1021 (2009). 8. M. L. Boyer, S. Srinivasan, J. Th. Van Loon, et al., "Surveying the Agents of Galaxy Evolution in the tidally stripped, low metallicity Small Magellanic Cloud (SAGE-SMC). II. Cool evolved stars". Astron. J. 142 (2011). 9. Castelli F., Kurucz R. L. New Grids of ATLAS9 Model Atmospheres // Modelling of Stellar Atmospheres: Proceedings of the 210th Symposium of the IAU / Eds N. Piskunov, W. W. Weiss, D. F. Gray. — Uppsala, Sweden, 2003.—Poster A20. 11. E. A. Den Hartog, J. E. Lawler, C. Sneden, J. J. Cowan, "Improved laboratory transition probabilities for Nd II and application to the Neodymium abundances of the Sun and three metal-poor stars". Astrophys. J. Suppl. Ser. 148 (2), 543—566 (2003). 12. J. H. Elias, J. A. Frogel, R. A. Humphreys, "M supergiants in the Milky Way and the Magellanic Clouds: colors, spectral types, and luminosities". Astrophys. J. Suppl. Ser. 57, 91—131 (1985). 13. J. R. Fuhr, W. L. Wiese, "A critical compilation of atomic transition probabilities for neutral and singly ionized iron". J. Phys. Chem. Ref. Data. 35 (4), 1669—1809 (2006). 14. J. R. Gerke, C. S. Kochanek, K. Z. Stanek, "The search for failed supernovae with the Large Binocular Telescope: first candidates". Mon. Notic. Roy. Astron. Soc. 450 (3), 3289—3305 (2015). 15. C. Gonzalez-Fernandez, R. Dorda, I. Negueruela, A. Marco, "A new survey of cool supergiants in the Magellanic Clouds". Astron. and Astrophys. 578 (2015). 16. V. F. Gopka, A. V. Shavrina, V. A. Yushchenko, et al., "On the thorium absorption lines in the visible spectra of supergiant stars in the Magellanic Clouds". Bull. 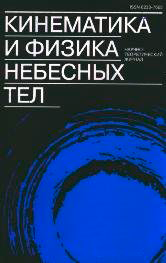 Crimean Astrophys. Observatory. 109 (1), 41—47 (2013). 17. V. F. Gopka, S. V. Vasileva, S. M. Andrievsky, A. V. Yushchenko, "Thorium lines in the spectra of several SMC supergiant stars". Odessa Astron. Publ. 20, 58—61 (2007). 19. V. Gopka, A. Yushchenko, V. Kovtyukh, et al., "The abundances of heavy elements in red supergiants of Magellanic Clouds". Odessa Astron. Publ. 26, 54—58 (2013). 20. V. F. Gopka, A. V. Yushchenko, T. V. Mishenina, et al., "Atmospheric chemical composition of the Halo Star HD 221170 from a synthetic-spectrum analysis". Astron. Reports. 48 (7), 577—587 (2004). 21. J. L. Greenstein, "Analysis of the metallic-line stars. II. ". Astrophys. J. 109, 121—138 (1949). 22. N. Grevesse, M. Asplund, A. J. Sauval, P. Scott, "The chemical composition of the Sun". Astrophys. and Space Sci. 328 (1—2), 179—183 (2010). 23. N. Grevesse, P. Scott, M. Asplund, A. J. Sauval, "The elemental composition of the Sun. III. The heavy elements Cu to Th". Astron. and Astrophys. 573 (2015). 24. O. Havnes, "Abundances and acceleration mechanisms of cosmic rays". Nature. 229 (5286), 548—549 (1971). 25. O. Havnes, "Magnetic stars as generators of cosmic rays". Astron. and Astrophys. 13, 52—57 (1971). 26. O. Havnes, P. S. Conti, "Magnetic accretion processes in peculiar A stars". Astron. and Astrophys. 14, 1—11 (1971). 27. A. Heger, C. L. Fryer, S. E. Woosley, N. Langer, D. H. Hartmann, "How massive single stars end their life". Astrophys. J. 591 (1), 288—300 (2003). 28. V. Hill, "Chemical composition of six K supergiants in the Small Magellanic Cloud". Astron. and Astrophys. 324, 435—448 (1997). 30. V. Hill, B. Barbuy, M. Spite, "Carbon, nitrogen, oxygen and lithium abundances of six cool supergiants in the SMC". Astron. and Astrophys. 323, 461—468 (1997). 29. R. W. Hildithich, I. D. Howarth, T. J. Harries, "Forty eclypcing binaries in the Small Magellanic Cloud". Mon. Notic. Roy. Astron. Soc. 357 (1), 304— 324 (2006). 31. R. Hirata, T. Horaguchi, "Atomic spectral line list". SIMBAD Catalog VI/69. ftp : (1995). 32. R. M. Humphreys, "M supergiants and the low metal abundances in the Small Magellanic Cloud". Astrophys. J. 231, 384—387 (1979). 33. Y. -WoonKang, A. Yushchenko, K. Hong, S. Kim, V. Yushchenko, "Chemical composition of the components of eclipsing binary star ZZ Bootis". Astron. J. 144 (2) (2012). 34. Y. -WoonKang, A. V. Yushchenko, K. Hong, E. F. Guinan, V. F. Gopka, "Signs of accretion in the abundance patterns of the components of the RS CVn-type eclipsing binary star LX Persei". Astron. J. 145 (6) (2013). 35. D. E. Kelleher, L. I. Podobedova, "Improved critical compilations of selected atomic transition probabilities for neutral and singly ionized carbon and nitrogen". J. Phys. Chem. Ref. Data. 37 (1), 267—706 (2008). 36. D. E. Kelleher, L. I. A criticalPodobedova, "Atomic transition probabilities of aluminum". J. Phys. Chem. Ref. Data. 37 (2), 709—911 (2008). 37. C. S. Kochanek, J. F. Beacom, M. D. Kistler, et al., "A survey about nothing: monitoring a million supergiants for failed supernovae". Astrophys. J. 684 (2), 1336—1342 (2008). 38. R. L. Kurucz, "Atomic and molecular data for opacity calculations". Rev. mex. astron. y astrofis. 23, 45—48 (1992). 41. R. L. Kurucz, E. Peytremann, "A table of semiempirical gf values. 1. Wavelengths: 5. 2682 nm to 272. 3380 nm". SAO Special Report. N 362 (part 1), 1— 1223 (1975). 42. E. M. Levesque, "Red supergiants in Local Group", EAS Publs Ser. Betelgeuse Workshop 2012. The Physics of Red Supergiants: Recent Advances and Open Questions , Eds P. Kervella, T. Le Bertre, G. Perrin.—2013.—60.—P. 269—277. 43. K. Lodders, "Solar system abundances and condensation temperatures of the elements". Astrophys. J. 591 (2), 1220—1247 (2003). 44. N. Martin, E. Maurice, J. Lequeux, "The structure of the Small Magellanic Cloud". Astron. and Astrophys. 215 (2), 219—242 (1989). 45. L. Mashonkina, T. Ryabchikova, A. Ryabtsev, R. Kildiyarova, "Non-LTE line formation for Pr II and Pr III in A and Ap stars". Astron. and Astrophys. 495 (1), 297—311 (2009). 46. P. Massey, K. A. G. Olsen, "The evolution of massive stars. I. Red supergiants in the Magellanic Clouds". Astron. J. 126, 2867—2886 (2003). 48. G. Meynet, V. Chomienne, S. Ekström, et al., "Impact of mass-loss on the evolution and pre-supernova properties of red supergiants". Astron. and Astrophys. 575 (2015). 49. D. C. Morton, "Atomic data for resonance absorption lines. II. Wavelengths longward of the Lyman limit for heavy elements". Astrophys. J. Suppl. Ser. 130 (2), 403—436 (2000). 50. U. Munari, A. Henden, A. Frigo, et al., "APASS Landolt-Sloan BVgri photometry of RAVE stars. I. Data, effective temperatures, and reddenings". Astron. J. 148 (2014). 51. S. J. Murphy, E. Paunzen, "Gaia's view on the lambda Boo star puzzle". Mon. Notic. Roy. Astron. Soc. 466, 546—555 (2017). 52. H. Nilsson, S. Ivarsson, S. Johansson, LundbergH. , "Experimental oscillator strengths in U II of cosmological interest". Astron. and Astrophys. 381, 1090— 1093 (2002). 53. H. Nilsson, Z. G. Znang, H. Lundberg, S. Johansson, B. Nordström, "Experimental oscillator strengths in Th II". Astron. and Astrophys. 382, 368—377 (2002). 54. N. E. Piskunov, F. Kupka, T. A. Ryabchikova, W. W. Weiss, C. S. Jeffery, "VALD: The Vienna Atomic Line Data base". Astron. and Astrophys. 112, 525— 535 (1995). 55. L. Prevot, N. Martin, E. Rebeirot, E. Maurice, J. Rousseau, "A catalogue of late-type supergiant stars in the Small Magellanic Cloud". Astron. and Astrophys. Suppl. Ser. 53, 255—269 (1983). 56. C. R. Proffitt, G. Michaud, "Abundance anomalies in A and B stars and the accretion of nuclear-processed material from Supernovae and evolved giants". Astrophys. J. 345, 998—1007 (1989). 57. D. Proga, S. J. Kenyon, J. C. Raymond, "Illumination in symbiotic binary stars: non-LTE photoionization models. II. Wind case". Astrophys. J. 501, 339—356 (1998). 58. J. Ren, N. Christlieb, G. VII. Zhao, "The Hamburg/ESO R-process Enhanced Star survey (HERES). Thorium abundances in metal-poor stars". Astron. and Astrophys. 537 (2012). 60. J. Simmerer, C. Sneden, J. J. Cowan, J. Collier, V. M. Woolf, J. E. Lawler, "The rise of the s-process in the galaxy". Astrophys. J. 617 (2), 1091—1114 (2004). 61. C. Siqueira Mello, V. Hill, B. Barbuy, et al., "High-resolution abundance analysis of very metal-poor r-I stars". Astron. and Astrophys. 565 (2014). 62. D. J. Smartt, "Observational constraints on the progenitors of core-collapse supernovae: the case for missing high-mass stars". Publ. Astron. Soc. Austral. 32 (2015). 63. O. Szewczyk, G. Pietrzynski, W. Gieren, et al., "The Araucaria project: the distance to the Small Magellanic Cloud from near-infrared photometry of RR Lyrae variables". Astron. J. 138 (6), 1661—1666 (2009). 64. K. A. Venn, D. L. Lambert, "The chemical composition of three Lambda Bootis stars". Astrophys. J. 363, 234—244 (1990). 65. K. A. Venn, D. L. Lambert, "Could the ultra-metal-poor stars be chemically peculiar and not related to the first stars?". Astrophys. J. 677, 572—580 (2008). 67. A. Yushchenko, V. Gopka, S. Goriely, et al., "Thorium-rich halo star HD 221170: Further evidence against the universality of the r-process". Astron. and Astrophys. 430, 255—262 (2005). 68. A. V. Yushchenko, V. F. Gopka, Y. -WoonKang, et al., "The chemical composition of p Puppis and the signs of accretion in the atmospheres of B-F-type stars". Astron. J. 149 (2) (2015). 69. A. V. Yushchenko, V. F. Gopka, V. L. Khokhlova, F. A. Musaev, I. F. Bikmaev, "Atmospheric chemical composition of the «twin» components of equal mass in the CP SB2 system 66 Eri". Astron. Lett. 25 (7), 453—466 (1999).